On September 28, 2011, my wife and I went to our 18 week ultrasound to find out if our first child would be a boy or a girl. We found out it was a boy, and that he had a special heart. Our unborn son was diagnosed with a critical aortic stenosis with evolving hypoplastic left heart. Photo credit: RLR Studio, Inc. Which means if he made it to birth, he’d have half a heart, need at least 3 open heart surgeries, and likely have a very difficult life. There was a new, cutting edge surgery, though, that might allow our son to have a whole heart. This complicated heart surgery would need to happen before he was born. We ended up doing it. Twice. Our son was born and we named him Ari. He’s since had two major open heart surgeries, has had scar tissue cut out of his heart twice, and has had 3 out of his 4 heart valves moved or replaced. 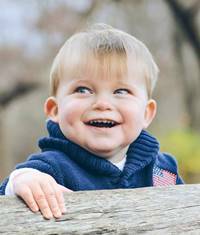 His third open heart surgery is scheduled for May 12. We’d like to say this should do it for a while and he’ll get better, but we can’t say that, and we don’t know if it will help. The outlook is cloudy. We have a new book, Insight Selling, coming out on May 5. It’s dedicated to Ari, and his congenital heart defect warrior brothers and sisters everywhere. The book is full of business examples of how buyers make purchase decisions and how the most successful sellers sell. In chapter 3, we include one very personal example: how we made the decision to have innovative heart surgery on our son before he was born. Since the book is dedicated to Ari, we wanted to make that dedication really mean something. So we’ve decided to donate all of the royalties we receive from book pre-orders and sales during the first week to congenital heart defect research through the American Heart Association. In other words: buy the book and the money we get will go directly to the American Heart Association. So here’s what we’re hoping you do: buy books—and ask your friends to buy books—and make us give more money away. The book itself is a great investment, too. Neil Rackham, bestselling author of SPIN Selling, wrote the foreword; it’s based on our groundbreaking research into what sales winners do differently; and it’s been making a difference in sales for companies around the globe. So if you have 30, 300, or 3,000 sellers, buy books for them and they’ll be more successful. And you’ll help save lives while we’re at it. Lives like that of our son, Ari. Thank you in advance for your support. We certainly hope you enjoy the book. Click here to buy the book before May 10 and support congenital heart defect research.